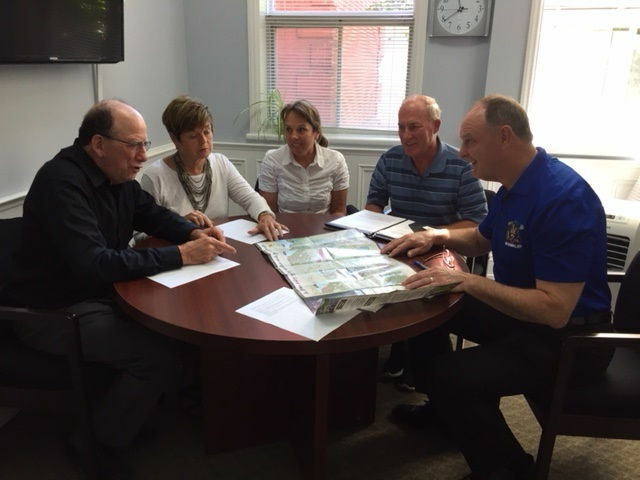 PEMBROKE, Sept. 7, 2018 - The four table officers of the Ottawa Valley Cycling and Active Transportation Alliance (OVCATA) - Pat Krose, Ron Moss, Debbie Fiebig and I - met with Ontario's new transportation minister, John Yakabuski, for a pleasant and positive hour-long talk about Active Transportation (AT) in Renfrew County and throughout the province. It is a real opportunity for our organization that our MPP is the minister, and especially so because our MPP is outgoing, friendly and knowledgeable. He has also been on our email list since the beginning and has gone to bat for us on issues with MTO in the past, so he didn't need a lot of coaching. Our agenda was simple: a couple of local issues, a couple of provincial issues, and an invitation to speak at our annual meeting this fall. We covered all the issues and a whole lot more and got a Yes on the annual meeting, if we can find a weekend that works for him. - AT, he said, is very important in terms of the biggest impending health issues with the aging of the baby boomers. It can lessen the impact, and therefore the cost to the health system, of problems like obesity and heart disease. - There will be less provincial money for municipalities for AT to the cancellation of cap-and-trade, but budgets have not been set yet. - John spoke of the importance of hard shoulders on highways and the economics of building them. He talked about how the extra costs of creating them can be compensated to a great extent, if not fully, by lower road maintenance and extended life of the road, as well as by increased safety. He comprehends the importance of continuing to develop of a provincial cycling network of highways with hard shoulders and appropriate signage. - Remarkably, John said that a lot of MTO's budget is likely to be taken up by transit in the Toronto area because, as the province's business centre, it is vitally important to "get cars off the road." This is certainly a value we share with him, and this value can positively affect policy regarding AT. - One of our most positive discussions was about the role of the MTO in educating drivers, cyclists and walkers about road safety and how that role can be expanded at little cost. - We had good discussions about the Algonquin Trail (former CP rail line), Highway 17, the need to get cyclists off that highway, and the possibility of MTO funding development of the Trail, from Matawa to Chalk River, for that purpose. We also discussed the difficulties of finding a cycling route on Highway 148, between the "Quebec turn-off" and Pembroke's city limits, where road construction is underway with no cycling routes planned because provincial commuter cycling funding that might have brought the Algonquin Trail to standard is not now available due to the new government cancelling that program, which was paid for under the cap-and-trade system. - We talked about how attitudes have changed toward cycling on roads. John recalled cycle trips from Barry's Bay to Killaloe as a youth where he and his friends simply assumed they would get off the road when cars approached because the prevalent attitude at the time was "they don't belong on the road." Now, he said, public view have changed greatly but, as he said, "Old attitudes die hard." - John invited us to submit a letter detailing or policy suggestions to him as Minister, and also to other Cabinet Ministers with related portfolios such as health, seniors, tourism and recreation. Overall, it was a very positive meeting that left the door open to lots of future contact, and we're thankful to John for doing that.